On August 23, scientists will mark the 20th anniversary of the National Science Foundation's Very Large Array (VLA), the most powerful, flexible and widely-used radio telescope in the world. "Twenty years ago, the VLA brought dramatic new observing capabilities to the world's astronomers, and today there is hardly a branch of astronomy that has not been profoundly impacted by the prolific research output of this radio telescope," said Dr. Paul Vanden Bout, Director of the National Radio Astronomy Observatory (NRAO). The anniversary will be marked in a ceremony at NRAO's Array Operations Center in Socorro, NM. The keynote speaker for this ceremony will be U.S. Senator Pete V. Domenici, R-NM. Also speaking will be Dr. Rita Colwell, NSF Director; Dr. Anneila Sargent, president-elect of the American Astronomical Society; Vanden Bout; Dr. Riccardo Giacconi, president of Associated Universities, Inc. (AUI); Dr. Paul Martin, chairman of the AUI board of trustees; and Dr. Miller Goss, NRAO's director of VLA/VLBA operations. "More than 2,200 researchers from hundreds of institutions around the world have used the VLA for more than 10,000 observing projects," said Vanden Bout. "Research conducted at the VLA has had a major impact across the entire breadth of astronomy, from nearby objects such as the Sun and planets of our own Solar System, to forming galaxies and quasars billions of light-years away in the farthest reaches of the Universe," Vanden Bout added. Major discoveries made by the VLA have ranged from the surprising detection of water ice on Mercury, the nearest planet to the Sun, to the first detection of radio emission from a Gamma Ray Burster in 1997. The VLA also discovered the first "Einstein Ring" gravitational lens in 1987, and the first "microquasar" within our own Milky Way Galaxy in 1994. Over the past two decades, the VLA also has made major contributions to our understanding of active regions on the Sun, the physics of superfast "cosmic jets" of material pouring from the hearts of distant galaxies, the mysterious central region of our own Galaxy, and the atmospheres of other stars, among many others. The results of research conducted with the VLA fill thousands of pages in numerous scientific journals and are cited throughout modern astronomy textbooks. In addition to such accomplishments, the VLA also has served as a prime tool for training young astronomers. More than 200 Ph.D degrees have been awarded by U.S. and foreign universities based on dissertation research done using the VLA. "Despite all these accomplishments, however, we are not simply looking back on this occasion," said Goss. "Instead, we have prepared a detailed plan for expanding the capabilities of the VLA, and keeping it at the forefront of science in the 21st Century. The Expanded VLA will incorporate new technologies to replace some of the 1970s-era equipment that remains, and add new antennas. The result will be an astronomical tool ten times more capable than the current VLA." The VLA is a collection of 27 steel-and-aluminum parabolic dish antennas, each with a dish 82 feet in diameter and weighing 230 tons. These antennas are arranged in a giant "Y" pattern 20 miles across on the high-desert Plains of San Agustin, 50 miles west of Socorro, New Mexico. All 27 antennas work together as a single radio-telescope system to produce exquisitely-detailed images of radio-emitting objects in the Universe. 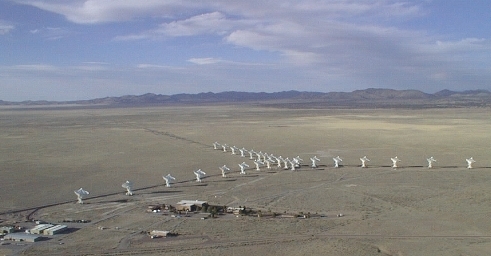 Received signals from all the VLA's antennas are brought together and computer-processed to make the images. In the 1950s, British astronomer Sir Martin Ryle developed the technique of using multiple, widely-separated radio-telescope antennas working together to make images far more detailed than could be made with any single antenna that could be feasibly built. Ryle received the 1974 Nobel Prize in Physics for this work. In 1956, the NSF created the National Radio Astronomy Observatory in Green Bank, WV, and contracted with Associated Universities, Inc., a private, nonprofit research organization, to build and operate the observatory. "We at AUI are proud to have built and operated the NRAO -- and the VLA -- since its beginning," said Dr. Riccardo Giacconi, the current president of AUI and former Director General of the European Southern Observatory. "The VLA has greatly improved our understanding of the Universe, and the Expanded VLA will be one of the prime facilities for meeting the challenges of 21st-Century astrophysics," added Giacconi. While NRAO scientists and engineers were constructing and using single-dish radio telescopes at Green Bank, they also worked on plans for a radio-telescope array based on Ryle's technique. By 1962, the phrase "Very Large Array" came into common use to describe this project. The Green Bank Interferometer, a three-antenna system, began operation in 1964, and was used extensively to gain practical experience in operating such arrays. In addition, it made significant scientific contributions. In 1967, NRAO astronomers and engineers completed the first formal proposal for a Very Large Array. The NSF submitted the VLA proposal to Congress in 1971, and the project received Congressional authorization in 1972. The Plains of San Agustin were selected as the VLA site that same year. Work at the VLA site began in 1974, and NRAO personnel began moving to New Mexico in 1975. By October of 1975, the first VLA antenna was complete and used to observe a galaxy 50 million light-years away in the constellation Virgo. In 1976, two VLA antennas were used together for the first time. In 1977, with six antennas operational, the VLA began to be used routinely for astronomical observations. The last VLA antenna became operational in 1980. The VLA was formally dedicated in October of 1980, and all details of the construction were completed in January of 1981, nearly a year ahead of the schedule that had been prepared in 1973, and at the budgeted cost of $78.6 million in 1972 dollars.